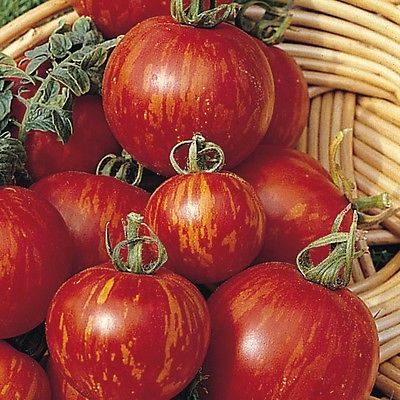 This selection of Indeterminate tomato produces a tangy flavoured crop of early ripening fruit that have yellow stripes on the red fruits. Sow Early April to end May Outdoors. Harvest in appx 14 weeks - August to October. Although an Easy plant to grow some care must be taken when transplanting and throughout the growing season. Transplant when large enough to handle taking care not to damage the stems or leaves. Transplant to final position for outdoor crops when all risk of frost has gone. As the plants grow it is common practice to remove side shoots maintaining one central stem - take care not to remove the flowering branches that form!! Support the plant as it grows with canes and when 3 - 4 truss's of fruit are starting to form pinch out the top growing point. This encourages the plant to put all its effort into fruit production. Tomato plants require a sunny position preferably sheltered from strong winds.